‘X Factor’ runner-up Taylor Henderson did pretty well for himself with his debut single ‘Borrow My Heart’. A double platinum smash, it slammed the No.1 spot and paved the way for the success of his self-titled debut album, which achieved a No.1 right slap bang in the middle of the busy Christmas period. Today, his fans have something new to call their own, with the release of his new single ‘When You Were Mine’, which is already firmly entrenched in the top five on iTunes. And in a move sure to whip his fans into further frenzy, the singer and his label Sony also timed the video reveal to perfection, also dropping it earlier this morning. 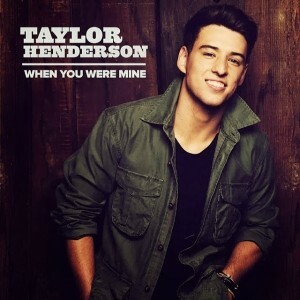 ‘When You Were Mine’ is, admittedly, a gorgeous track that showcases Taylor’s honeyed vocal superbly. Soft, well crafted acoustic pop in the same realm as James Morrison that seeks to draw you in like a warm embrace. The clip sees Taylor running a record store, but it’s one of his (very tardy) customers that’s caught his eye. It seems it’s not just shopping on her mind.